Abstract: Kuthtec use a larger copper center than most manufacturers, extending it the full 30mm height of the heatsink, 30mm. 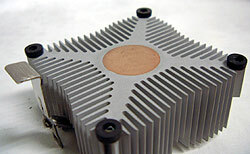 The KTM3000 is something like the 200th heatsink to cross the test bench here at FrostyTech.com, and only one of a handful from Kuthtec - a Taiwanese manufacturer which are well known for the KTM2101 model. Kuthtec (Kuang Thousand Technology Co. Ltd) have endowed the KTM3000 with two things which should help this heatsink reach pretty good temperature values. First off is naturally the design - the core of the heatsink is surround by fins and exhaust air exits directly on the processor lying below. 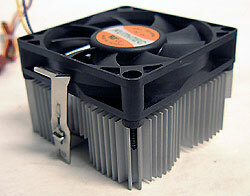 The second most important aspect is the copper core which lies at the heart of this heatsink. Now copper cores in heatsinks like the KTM3000 are nothing fantastically new, but they can be especially useful when it comes to improved heat flow. Since the processor core makes contact with the copper directly, the heat energy is moved up to the remaining aluminum structure of the heatsink efficiently. 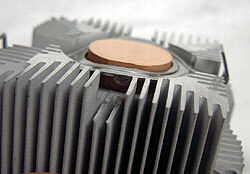 Kuthtec use a larger copper center than most manufacturers, extending it the full 30mm height of the heatsink, 30mm. Some heatsink designs we have seen recently have cut the copper center to about 3/4 of the full height. This apparently makes the heatsink work a little better, but we shall have to see for ourselves in the case of the Kuthtec KTM3000. Fan Specs: Everflow, ~4000RPM, 12V, 0.23A. In addition to the unique construction of this model (actually this is a prototype of the KTM-3000) we find that Kuthtec have added a few surprises. Below the fan rest four washers to A) raise the height of the fan above the top of the heatsink and B) dampen any vibrations which might occur in the fans' motor an be transferred to the rest of the computer. Cooling fans always tend to work a little better when there are a few millimeters of separation between the base and the heatsink fins. On the bottom of the heatsink we find a rather ingenuitive clipping method. Rather than cut a big hole down the center of the heatsink body, or one of a half-dozen other methods, the engineers have devised a clip which 'bolts' onto the copper insert directly. The stainless steel clip pivots just enough, and comes equipped with a thumb rest, that installing the heatsink is very straight forward and simple.